Looking to upgrade your lawn? Maximize the health of your lawn with our line of lawn care services. Keep your grass green and pristine with our professional lawn mowing service! Aeration is the process of creating holes in the soil to allow more airflow. The grass on your lawn exchanges oxygen and carbon dioxide through these holes. Along with the air, the holes fill with water and other nutrients (from fertilizer or natural sources). As these holes are spaced throughout the lawn, the roots of your grass will have all the resources it needs to thrive. Keep your garden tidy & weeds at bay with our mulching service. You can use mulch for garden beds, flower beds, lining the edges of your yard or just to change up the appearance of a section of your yard. Typical service will be done with wood chips, but you can make custom requests for another material. Many homeowners have their mulch installed in the spring, when the soil has warmed up a little. Professional companies deliver the heavy bags of mulch, although they can also be picked up from local hardware and garden stores. Get your yard cleaned from all the winter debris or keep those falling leaves under control. Options to add flower bed clean up and a full lawn mow. Our network of local pros have the equipment and experience to make leaf removal a breeze. Your lawn will be clean and look great, and your back will feel like a million bucks! Lawn fertilization is a key component to having your grass grow strong and healthy. More than just lawn maintenance, fertilization treatments can improve your lawn’s overall health, appearance & prevent weeds from growing in your yard. Multiple treatments or applications of fertilizer throughout the year is common, ensuring your lawn has the proper nutrients available all year long. While fertilizers are available at local hardware stores, most homeowners choose to have a professional landscaping company treat their lawns. Applying fertilizer improperly can have adverse effects on a lawn, so research, education and experience are important when thinking about a fertilization treatment plan. Done correctly though, fertilizing a lawn can improve grass health and overall yard appearance! Don’t see your service listed? Give us as many details as possible for the job you would like done and we will help you out! Have a pro trim or prune your shrubs, ornamental trees or perennials. We’ll trim back overgrown plants or prune dead, loose or infected branches and stems! Regular trimming and pruning can keep your shrubs, hedges and plants healthy. When our pros trim for you, they’ll cut back any dead, dying or diseased branches. Your plants will look, and feel, great! Your most burdensome chores taken care of from anywhere. Download our free app to book and manage your appointments on-the-go. 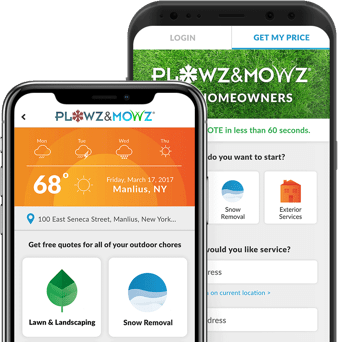 Enter your phone number, we’ll text you a link to get the PLOWZ & MOWZ app. Ready to book your service? Outsource your chores to the Pros. Are you a licensed contractor or landscaper? professional? Join our fleet. It’s completely free! © 2019 Plowz & Mowz Inc.